While Christmas dates back hundreds of years before, it was the start of the 20th century that saw the turn towards the lavish and very commercial holiday that we all know today. Here’s a very brief history of Christmas traditions from the last century. The first Christmas card was created in 1843 by John Horsley, and by the turn of the century the Victorian’s love of sentimental greetings had made this a popular tradition. The Victorian styles of decorating carried into the start of the 20th century, with gilded nuts, candles and paper ornaments adorning trees. This decade also saw the creation of what was to become one of the most popular children’s toys of the century; the Teddy Bear. Named after President Roosevelt, the charming story of the origin of this toy and its name can be read here. As Christmas rapidly became a highly commercialized holiday, more and more companies used it as a means of selling their products, and the image of Santa Claus began to morph into the one we are familiar with today. It was in the 1910s that Santa’s now unmistakable look, with red suit and pants trimmed in white fur, matching cap and long white beard, began to become the norm. While a legend has grown that claims Coca Cola invented the modern-day image of Santa, that is not quite the case. Prior to the famous Coca Cola Santa (who was created in 1931), the jolly elf had been portrayed as anything from tall and lanky to a munchkin-sized man. Norman Rockwell had painted a Santa who is strikingly similar to the 30s Coke version all the way back in 1911, however it wasn’t until Coke began regularly producing consistent looking Christmas ads that the current version of St. Nick really began to stick. For an interesting pictorial history of Santa, check out this link. By the 1920s the upper class had traded-in their candles for electric Christmas lights, and trees were as lavish and daring as the fashions of the decades. With the rising popularity of the wireless (radio), the 1920s also saw the first Christmas radio broadcast when, in 1922, Arthur Burrow presented “The Truth About Father Christmas”. In the midst of the Great Depression few had money to spend on food and clothing, let alone Christmas gifts and decorations. Still, the tradition of putting up a tree hung on, with many families owning decorations they had purchased in the more prosperous 1920s. Homemade ornaments also adorned the tree, made out of things like the foil paper saved from cigarette packs. As previously mentioned, Coca Cola started to advertise with their own version of Santa, and upbeat Christmas songs were enjoyed on the radio. Advertisements still bombarded shoppers with ideas for the perfect Christmas gift, only their tactics had changed; a focus on the practical and sometimes financing options were promoted. The popular character Rudolph, everyone’s favourite red-nosed reindeer, was created in 1939 by Montgomery Ward. Although it wasn’t until a decade later when Gene Autry released the song that we’ve all learned as kids. The 1940s saw the Second World War, and with that came rations and a reminder that the war effort should be supported above all else. Sales in non-necessities like Christmas lights dropped dramatically as many companies changed their focus to assist in the war effort. War bonds were promoted as a perfect gift for any family member or friend, and Santa himself switched his classic red & white outfit to don army duds and support the cause. With many families missing fathers, brothers and sons overseas, Christmas could have been a bittersweet time. However, back home the masses were reminded to keep their spirits up while fighting the good fight, so many Christmas celebrations resumed some of the splendour they had seen before the Depression. The post-war boom made the Christmas of the 1950s one of the biggest and gaudiest yet. The Baby Boom meant there were lots of families with youngsters, and so the toy market was buzzing. Wide-spread prosperity meant most were lucky enough to be able to afford Christmas celebrations, and women’s magazines, eager to encourage them to return to the home, now that the war was over, pushed for the ideal Christmas season, full of elaborate recipes and decor. Television was also becoming popular and with it came a host of Christmas specials. Stars like Nat King Cole and Bing Crosby recorded Christmas songs and popular shows like I Love Lucy recorded special Christmas episodes. By the 1960s, the fads of the 50s were firmly cemented; every toy imaginable was available on the market and they were advertised directly to children in between the cartoons they watched on tv. The Christmas shows we still see today – Rudolph the Red Nosed Reindeer, Santa Claus is Coming to Town and Frosty the Snowman – first appeared on the airwaves and decorations were more colourful and outlandish than ever before. There was significant variety now as well. Christmas trees could be anything from your traditional green pine, to the popular aluminum trees that came in silver, aqua and even pink! And don’t forget the fake snow! The concept of “Kitschmas” was truly born in the 1960s. Retro Radio Hour – Spring Fling! On Thursday May 14, 2015, Bygone will be presenting the 5th show in the retro radio series, Retro Radio Hour – Spring Fling. We are back at the SoCap and as always, tickets are only $5 cash at the door. This week’s show features; Emily Dix, Matt McGrath, Elizabeth Rose Morriss, Ian McGarrett, Mikey Zahorak, Peter Grant Mackechnie, Nicole Byblow, Astrid Atherly and Joseph Vita with magic by Leigh Beadon. While Rope is Chelsey MacLean’s first Bygone Theatre production, she and director Emily Dix met each other in high school and first worked on a play together in 2007! Chelsey plays the dim-witted Leila Arden. I had actually been directed by Emily Dix before, for my first play! I had always looked up to Emily and she inspired me to try my hand at directing the following year. I was eager to work with Emily’s professional and artistic skills once again with the added benefit of us bringing our new training to the table. 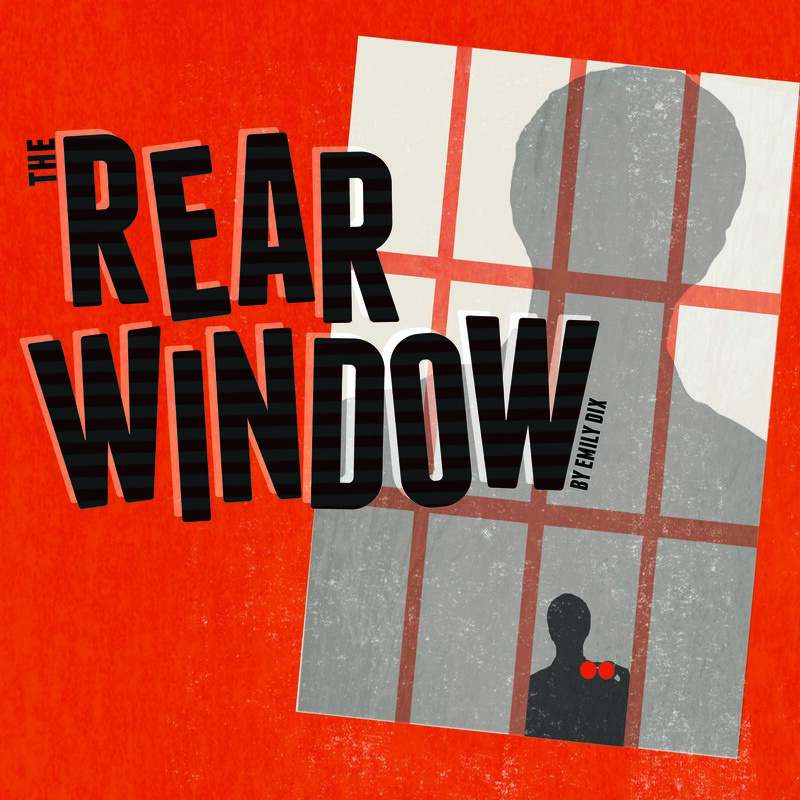 I was also excited for this project as I am a big Patrick Hamilton fan (Let’s do Gaslight next!). 2. What is your favourite part of working on a site-specific play that runs in real time? My favourite part of working in a site specific play is that both actor and audience can build a relationship with their environment, which I think brings both parties closer together; the actor endows the very setting the audience sits in while the audience has the advantage of not only watching a reality unfold, but find themselves immersed in it. I believe the real time aspect furthers the suspension of disbelief as the audience does not feel interrupted, and the actor can have the treasure of experiencing the minutia of their character’s moment to moment thought process. To prepare for Rope, I read a few of Patrick Hamilton’s works to familiarize myself with his style, researched the history and setting of the play, then the history and setting of where our production places Rope to find connections/ contrasts; understanding the norms for women at this time in history was quite helpful. As I further explored Leila Arden and her film buff nature, I have happily taken up watching movies from the 1920’s as an additional step to understanding her influences. I really value the cast of Rope. Every rehearsal I have the gift of learning a little something from each member of this diverse group of actors and those pieces add up to creating a fantastic experience. Everyone should come see Rope and support local theatre because its a provocative mix of terror, comedy, and psychological intrigue set in our very own Toronto with a timeless story that entertains and questions! Why watch another Whodunnit, when you can be in the room to witness what unfolds once “it” is done? Besides, Leila Arden saw it once, and she thought it was good, dear; why absolutely marvelous! Accurate period-appropriate costumes are an important thing to me, and to Bygone Theatre. 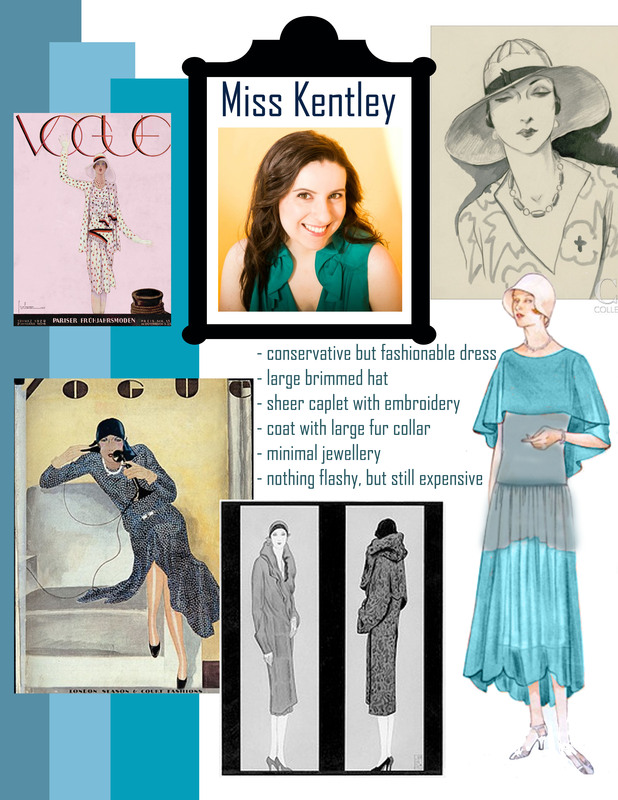 I spend a considerable amount of time researching vintage fashion, and then even more time trying to figure out how to make it work on a budget. 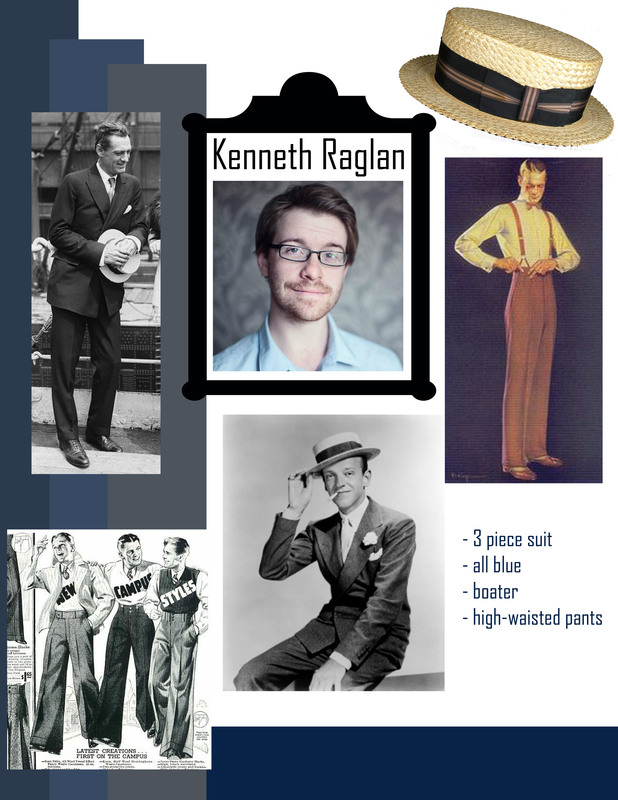 For a simple breakdown of what I’m looking for in terms of costumes for Rope I’ve created these costume boards. I am a fan of very specific colour schemes. While I could easily do the show with all the actors wearing any colour that suits them, when I first start planning a production, one of the first things that pops into my head is the overall design and the colours that I want to use. For Rope, I decided to go with what I’ve been describing as a “bruise” palette; dark blues, purples and greys, along with accents of green. Bruises typically have some yellow in them too, but I am avoiding warm colours in the costumes. Instead, I will have gold and brass accents, bringing in some warmth along with the metallics that were popular in the decade. I am keeping the actors mostly monochromatic, so to add interest I am using a lot of texture; wool, tweed, velvet, satin and detailed bead work will keep things visually interesting and stop them from looking too “flat”. Leete Stetson stars as Brandon Wyndham; dashing, devilish and debonair. Brandon is described as not being “dressed”, ie. he is in casual attire. However, he still needs to look fashionable and expensively dressed. 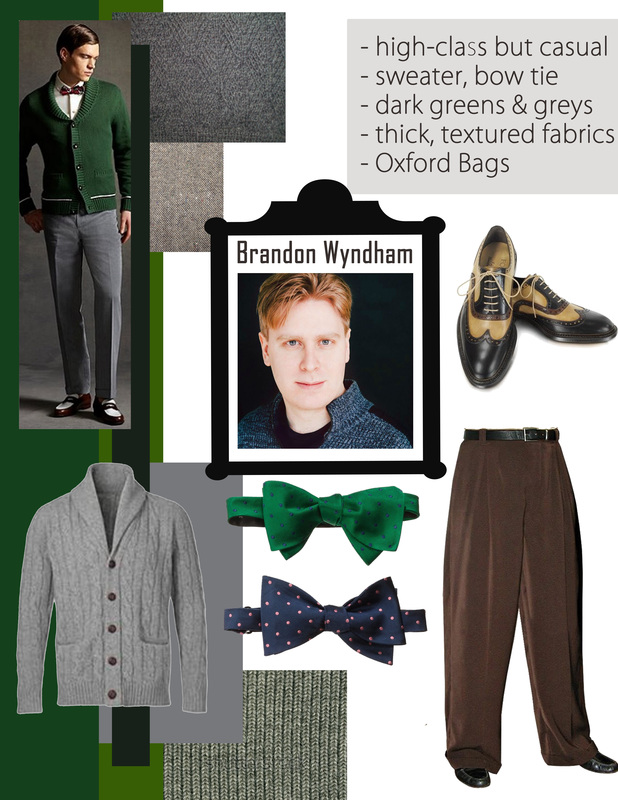 I am planning on putting Brandon in the very trendy Oxford Bags, along with a thick wool sweater and a bow tie. Nicholas Arnold plays the quiet, anxious, gifted but shy James Kelly. 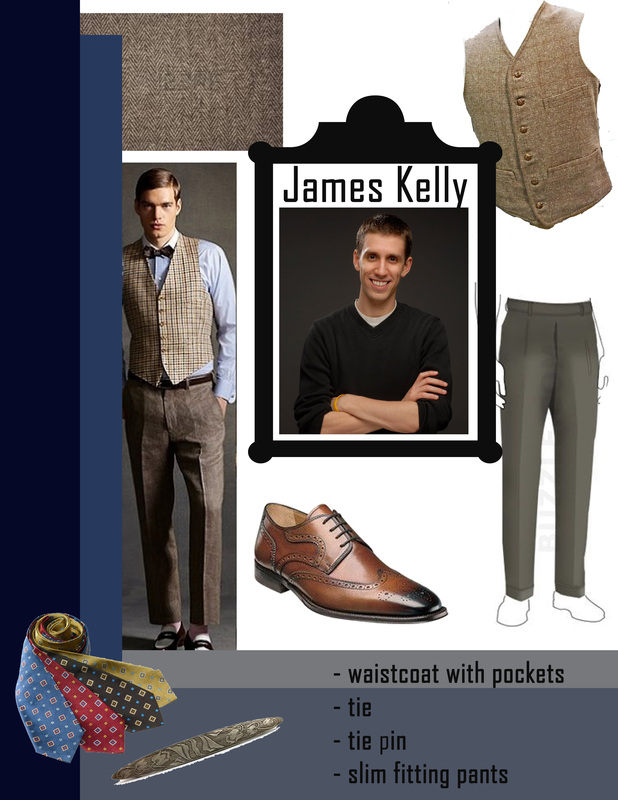 Like Brandon, James is wearing a more casual outfit at home, so I am planning on putting him in a vest without a jacket. The script gives me a few specifics to work with; he needs a waistcoat with pockets and a tie pin, which means he will be wearing a neck tie. Jamieson Child plays the crippled poet, Rupert Cadell. 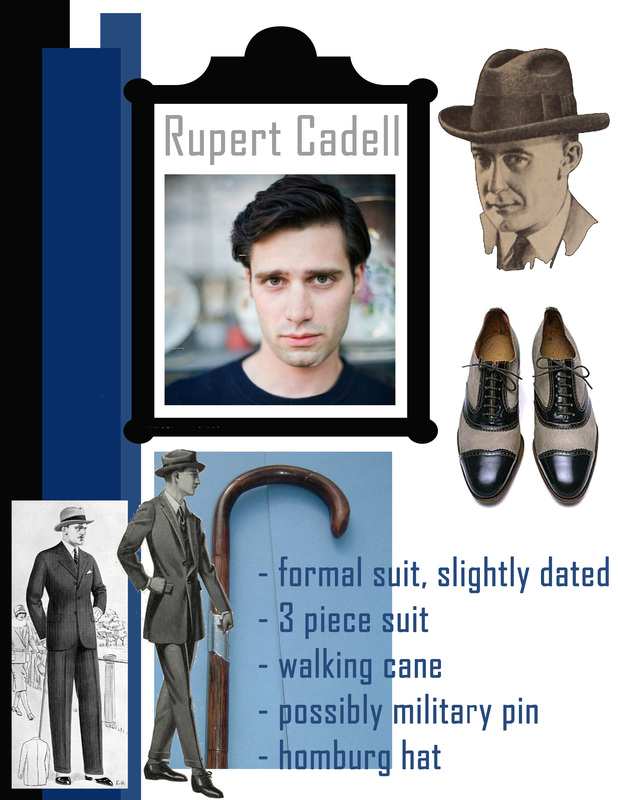 While Rupert comes to the party “dressed” in formal attire, he is not the type to be overly concerned with fashion, and so I picture him in slightly out-dated, less expensive clothes. Also, being a writer, I can’t help but picture Ernest Hemingway when I think of him. Chelsey MacLean plays party-girl Leila Arden. Leila is celebrity obsessed, superficial, and overly concerned with her looks. 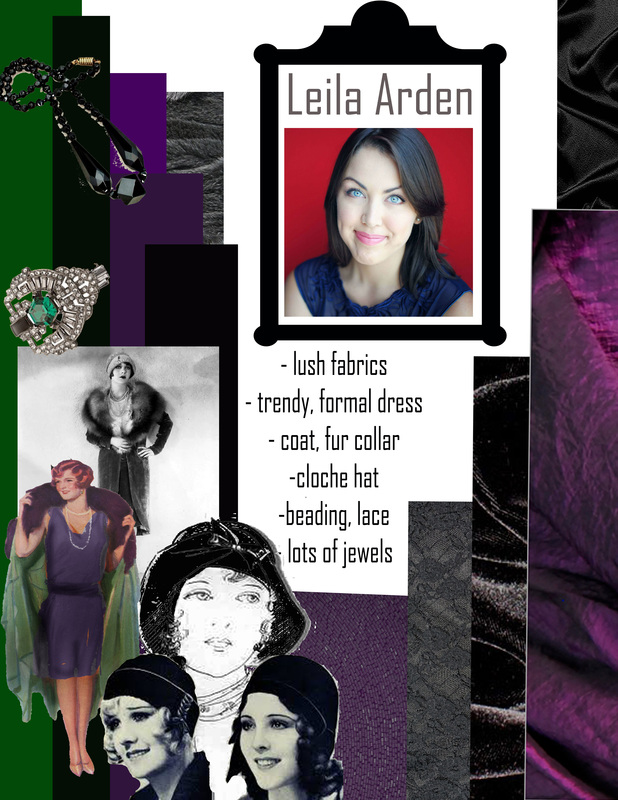 I see her in a typical flapper style; lots of jewels, lush fabrics, and a stylish cloche hat. Producer Matt McGrath is playing boy-next-door, Kenneth Raglan. Kenneth is young, college educated, preppy and well-off. He is embarrassed by showing up to the party “dressed”, which means he is in more formal clothes than Brandon and James. I want him in blue as well, but whereas James has a lighter blue with browns and Rupert has blue and black, Kenneth will likely have matching suit, vest and pants, all in a dark greyish blue. Is played by Elizabeth Rose Morriss. Miss K is a little older and considerably more conservative than Leila, so I’ve chosen a less-flashy dress style for her. Rather than cover her in beading and fringe, I am looking for a fabric with a simple pattern; likely something floral. I think she may wear a wider-brimmed hat. 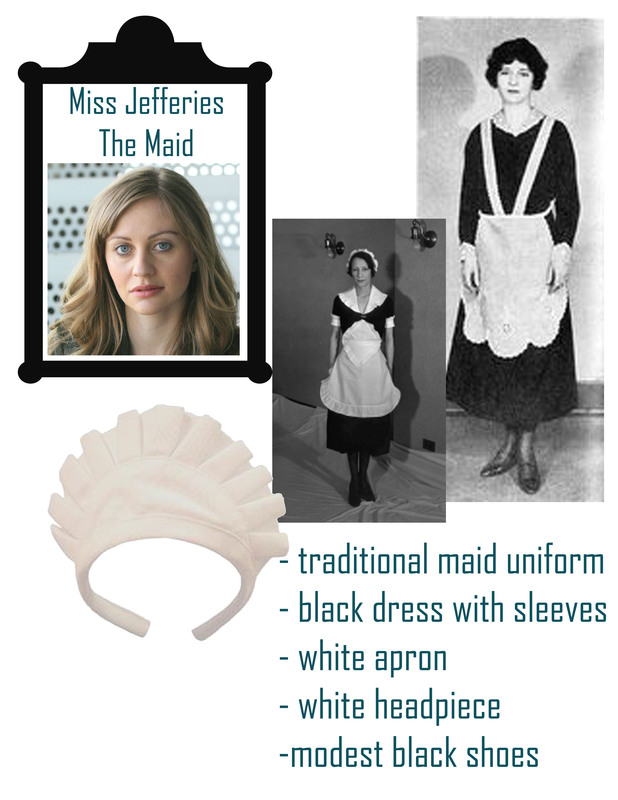 Caitlin Robson is playing Miss Jefferies, the maid, who will be wearing the traditional uniform. Black dress with sleeves, a white apron, decorated with lace, and a white, ruffled headpiece.